Here’s a secret: I am uncomfortable with Mother’s Day. Don’t get me wrong—I cherish a day with my family. I love the effort my husband, son and daughter put in to treating me well. I love the gifts, the cards, the flowers, the special meals―I appreciate and welcome all their efforts. What makes me uncomfortable is the celebration of me, of what I do. What I do is not what gives me satisfaction, is not what brings me joy about being a mother. Rather, it is the intimate connection with the people of love. It is the sharing with my husband in the most productive and creative venture I can imagine: nurturing our children. It is watching my children grow, being there for their joys, their sorrows. 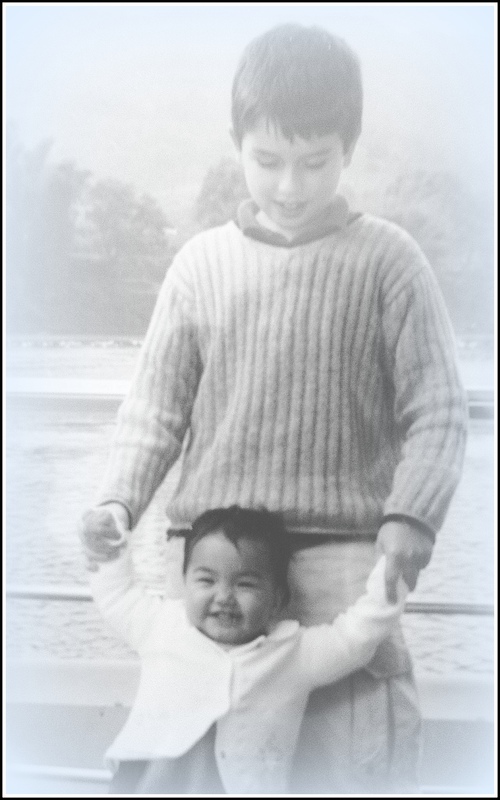 Our children, Clark and Isabel, each came to us in different ways. My husband and I met and married in our late thirties. We knew we wanted children, knew we’d be good parents together, but had no way of knowing if we’d be able to have children at our age. We were lucky. My pregnancy with Clark was charmed, his birth a surge of energy in our lives like we had never known before, and the love that followed between the three of us, the bond we share, is incomparable in my lifetime. We knew we wanted another child, Clark wanted a sibling, but none of my later pregnancies held, and when it became clear that I was risking my life to try to have another child, we stopped trying to conceive. After shedding many a tear for the unborn children we never knew, we found our daughter Isabel. Through a lengthy and at times arduous adoption process, our family became complete when Isabel was placed in our arms thousands of miles away in China. The day we brought her home wrapped in blue fleece, covered with the moon and stars, she felt her first snow flake when we stepped off the airplane on a chilly day in Burlington, Vermont. With that fresh moment as a marker, we began the journey to a newly configured, absolutely whole, family. People often ask me if it is different to parent a biological child and an adoptive child. The short answer is yes, it is different. While the love I feel for both Clark and Isabel is equally strong, while I am certain of my identity, my role as their mother, the challenges and fears are as different as they are different people. I worried when he was younger that Clark would inherit some of my lesser qualities―my tendency to worry (no), my flat feet (yes). With Isabel, I feared she would not accept me as her mom when she could speak the word. But she is as loving, attentive a child as I could ever dream to have in my life. Clark is bright, outgoing funny, smart. He makes his saxophone sing. He’s also the bravest person I know. When ulcerative colitis nearly took his life at age 16, he faced hospitalizations and surgeries and healing with his head held high, with a strength I admire. Isabel is beautiful, smart, talented, a gifted dancer. She is a hard worker, she is the ultimate optimist―when she first came to us, she was understandably afraid but still willing to love, to put her arms around us, to accept our love and our comfort. And now that she is old enough to look inside herself, to wonder about her history and how it will affect her future, she is willing to ask the hard questions. I admire her bravery, too. So Mother’s Day, to me, is really about celebrating them. It is about my husband’s patience as a father, about Clark’s accomplishments as he moves into manhood, about marveling at Isabel and all her many talents. It’s about celebrating my friends and family who are mothers. It is about nurturing the bond of motherhood. Today I applaud each of you, your families, your children. 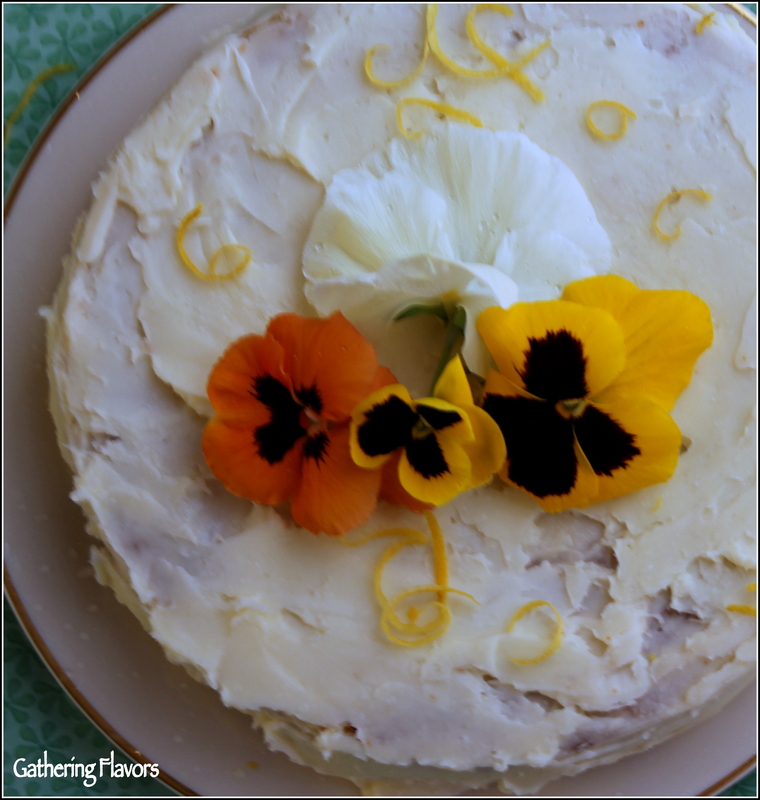 My gift to you is this simple Golden Cake with Buttercream Frosting Garnished with Fresh Pansies. Made with olive oil and white wine, the cake itself is moist with a fruity flavor. The buttercream frosting, flavored with real vanilla and fragrant lemon zest, is a nice balance of rich and light. The textures are phenomenal. 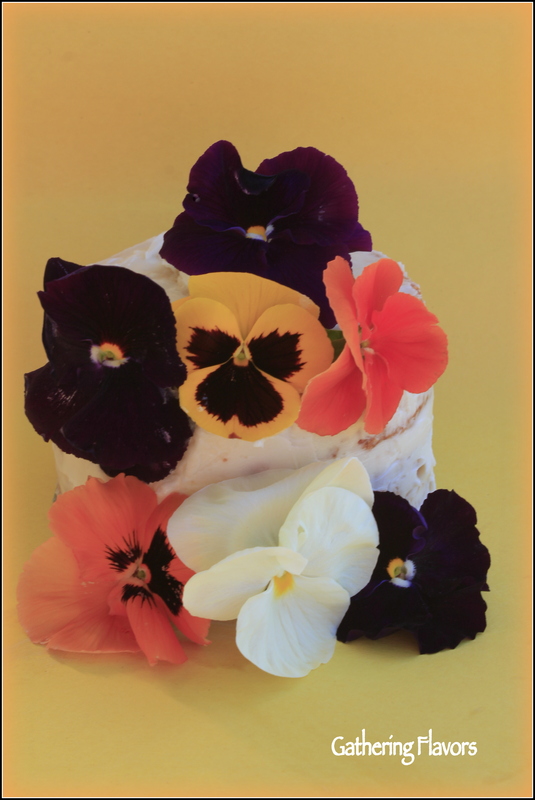 Adorned with colorful pansies, this beautiful confection will be a welcome gift to your holiday meal. Preheat oven to 350 degrees F. Lightly butter two 9-inch round cake pans. Using an electric or hand-held mixer, beat the sugar and the eggs together until creamy. Add the olive oil and wine. Beat together. Sift the flour, salt and baking powder into the bowl with the liquid ingredients. Gently mix together. Add the vanilla extract. Stir to combine. Pour the batter into the prepared cake pans. Set in the center of the preheated oven and bake until the cake has pulled away from the sides of the pan, the top is golden, and a toothpick inserted in the center of each cake comes out clean. This should take about 30 minutes. Let the cakes cool in the pan for a few minutes, then turn them on to a rack . Cool completely before frosting. Make the buttercream frosting by placing the butter and confectioner’s sugar in the bowl of a food processor. With the mixer on high, beat them together until smooth. While the processor is on, slowly pour in the cream through the feeding tube. Process until smooth. Add the vanilla extract and the pinch salt. Process again. To assemble the cake, if making single layer cakes, simply spread the frosting on the top and sides of the cake. To make a layer cake, spread the frosting on the bottom layer, top and sides. Place the second layer on top of the first, then spread evenly with frosting all around. Place cakes on serving platters. Sprinkle with freshly grated lemon zest. 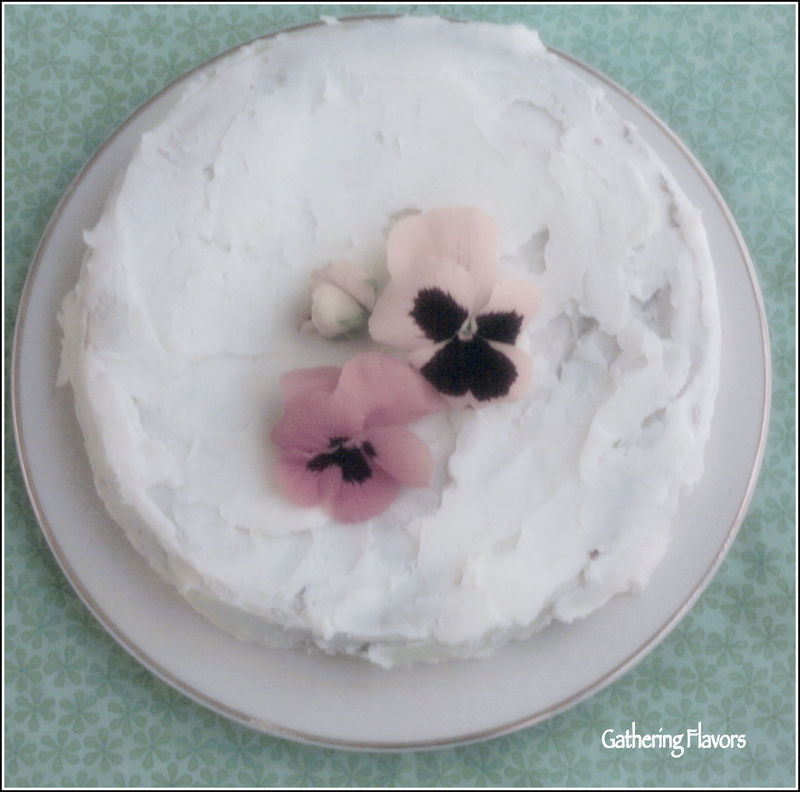 Garnish with fresh or sugar flowers. 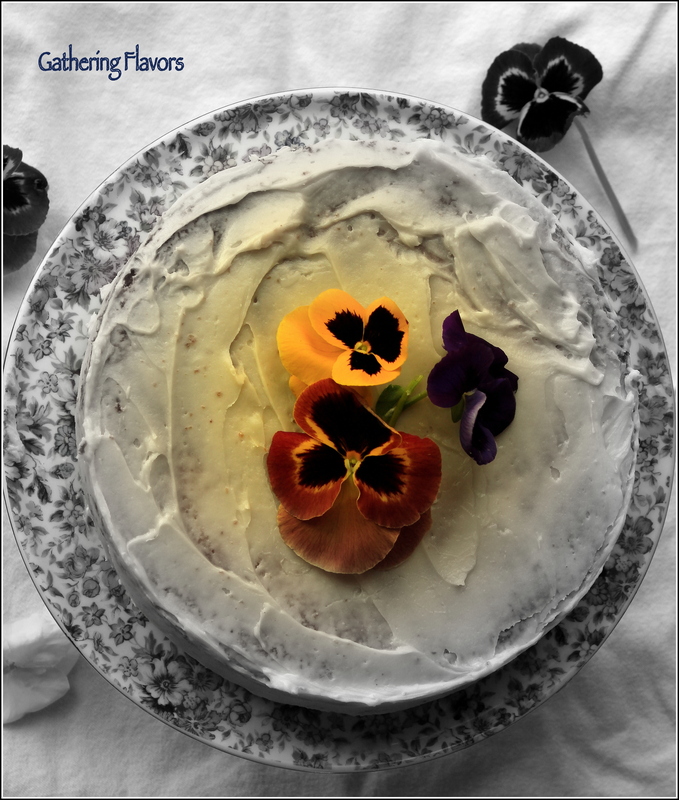 The cake layers are based on a recipe from the Silver Palate Cookbook by Sheila Lukins and Julee Rosso. The original recipe calls for using vegetable oil instead of olive oil. The Buttercream Frosting is adapted from How to Cook Everything by Mark Bittman. 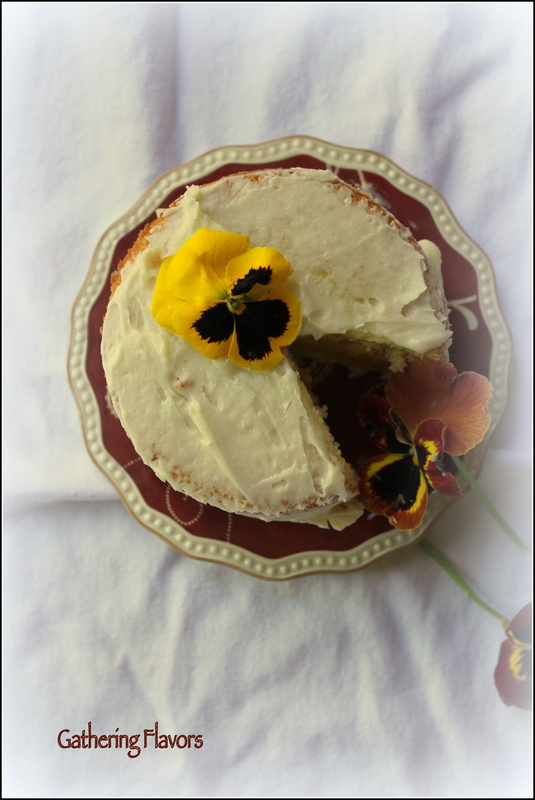 Pansies are fully edible. If you do not grow them yourself, buy them from a reputable organic farm. 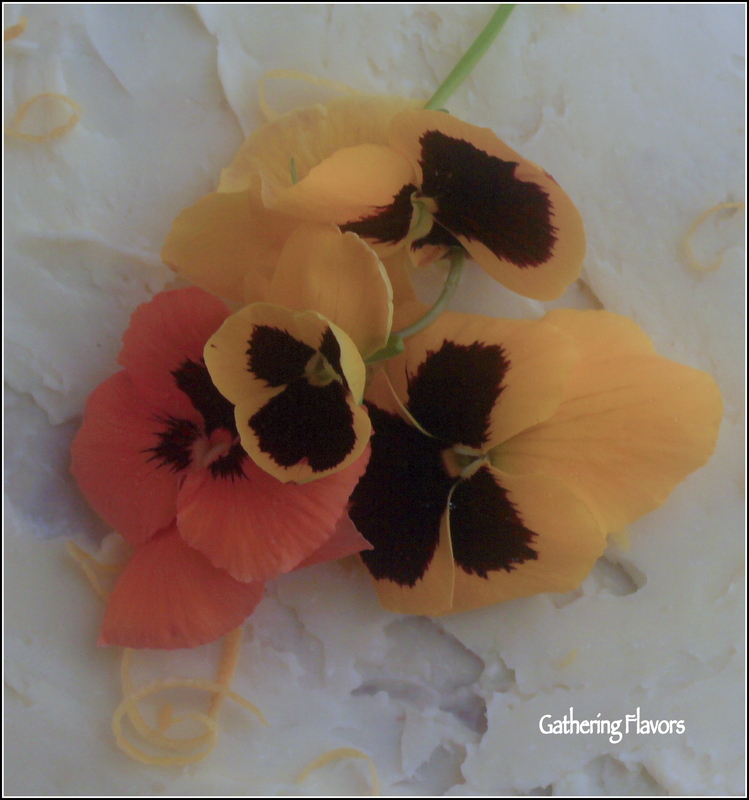 Click here for more information on edible flowers.